This recipe is literally the inspiration for my initial family cookbook project I started 7 years ago now. One of my childhood favorites was an applesauce cake my maternal grandma made, I remembered the spicy moist cake and the tangy smooth cream cheese icing, and I always wanted to recreate that cake. My mom insists it always had icing sugar sprinkled on top with cherries. Weird, the myth of the applesauce cake and we all have a different version in our minds! One thing is for sure, many decades went by after my grandma passed, and no one could find the recipe. I just knew, that I would be the one to record the recipes for my family, before I forgot them! Recently, my aunt sent me a recipe from a letter that a second cousin sent her, who found an applesauce cake recipe in her mother’s possessions. She assured my aunt that her mother (my great aunt) was the baker of the family, not my grandma, so this must be the recipe. 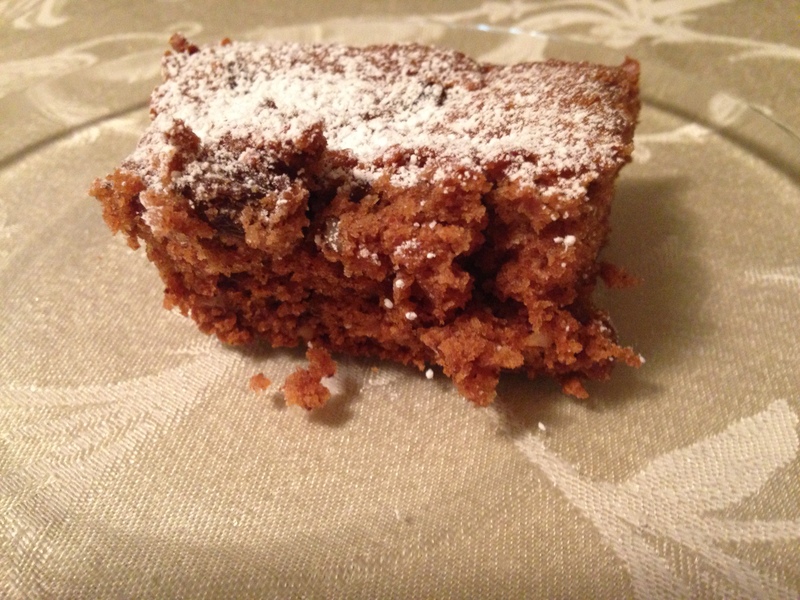 Well….whoever created the recipe, this one is very different than any other cake I have ever made. Bizarrely, it doesn’t even have eggs in the batter. But it worked, first try, and tasted amazing. My grandma used apples from the trees in her yard and made homemade applesauce for the recipe, I used some of the apples from apple picking, made homemade applesauce too, and used that for the cake. It tasted of the past, and I am so glad the recipe surfaced. Next time I will make it with cream cheese frosting and it will be off the hook! And by the way, my mom says there should be egg in the cake, so please feel free to add an egg. Preheat oven to 350 degrees then grease and flour a 9 X 13 inch pan. 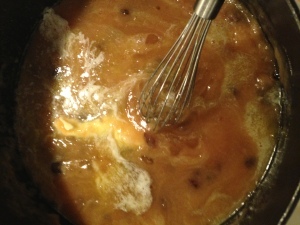 Combine in a large pot the butter, sugar, applesauce and raisins and heat together, then cool. Add all the rest of the ingredients, it will seem too dry but as you stir it with a wooden spoon you will find it a very moist batter. Pour into cake pan (apparently my Grandma used a bundt pan according to my mom, I remember it being a sheet cake). Cook for 40 minutes then do a toothpick check in the center, if it comes out clean you are good, if it is really wet still, give it a bit more time. Here’s to documenting our family’s history before our memories confuse them! This is the best apple sauce cake ! I use butter cream frosting and I make it into 3 mini loaf cakes~ as gifts. We love it with vanilla ice cream ! I always use the molasses for the extra old fashion taste. I am so proud of this family of good cooks !! I think I’ll move to the north and plant an apple tree in my yard .